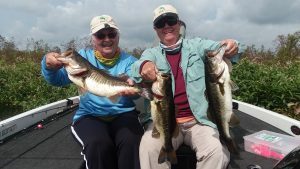 Sharon and Sue drove down from The villages in Central Florida down to the KOA campground here on the lake to go out with Okeechobee Bass Fishing Guides and catch these fish. These lady’s are avid fisher-women and have traveled all over the U.S. fly fishing and fishing many different fish from Trout, Sea Bass, Stripers in the North East, and now down to Okeechobee to catch these large mouth. It was a great day and beautiful weather to be out with these great lady’s catching there first Okeechobee Bass.